Confidence plays an essential part in your ability to putt well under pressure. Better described as a feeling of assurance, confidence is one of those vague qualities like 'feel' and 'touch' that we know we need to excel in, but are not quite certain as to how to attain it. In golf it is your Performance on the course that counts. Being upbeat and positive are good attitudes to have, but unless you have mastered certain basic skills, your golf and your putting are unlikely to improve despite your outlook on life. What makes us feel self-assured on the putting green is the knowledge that we understand what it takes to putt well, and are not reliant simply on hope. In golf, as in life, if you don't have the necessary skills to do something, being motivated to do it is not enough to get the job done. Pumping yourself up and then expecting a better result smacks of self-delusion. To putt well you must be capable of stroking a straight putt with good speed. You must complement this ability with accurate aiming and sound green and putt reading. Come up short in any one of these areas and your overall performance and underlying self-belief will suffer. Confidence is not earned through putting with more bravado. Certainly you have to believe that every putt can succeed as there is no point in being pessimistic. But cockiness is no substitute for ability. 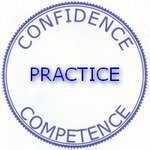 You build your belief in yourself with quality practice. 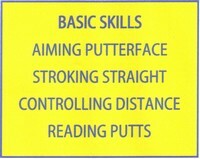 The more you practise your putting using sound fundamentals, the more you will begin to see better results. It is not possible to hole every putt as there are factors affecting the roll of the ball that are outside of your control. However, you can execute or make each putt knowing that you have done all that you can. When you putt with an understanding of what is required, you can avoid negative thoughts and performance anxiety. You know what works best and you are doing it. You have paid your dues. From my research there appears there is no quick-fire magic formula for achieving instant belief in your putting. As Ben Hogan used to say 'the secret is in the dirt', meaning the dirt of the practice range. With quality practice you will steadily grow a belief in your ability to stroke good putts more consistently. And that is all you can do.